This post is an Aadi Velli special!! Please refer to my other Festival delicacies, Payasams and kheers and celebrate this special Aadi month with genuine devotion. 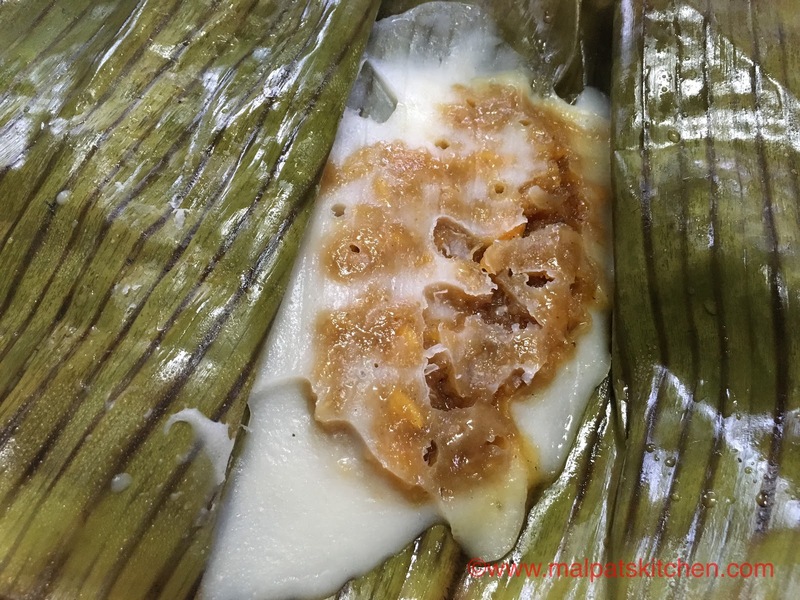 It is a Kerala delicacy....traditionally rice is ground, then made like dosas / pan cakes on banana leaves, on which the sweet stuffing is spread and steamed as packets. 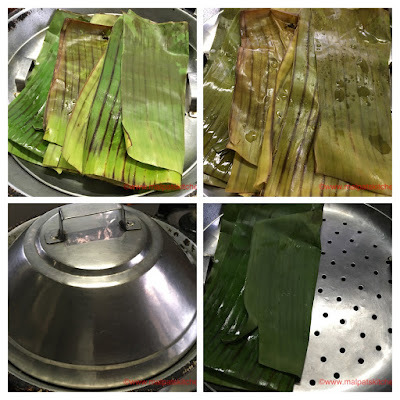 This delicacy acquires extra aroma and taste since it is being steamed in banana leaves. 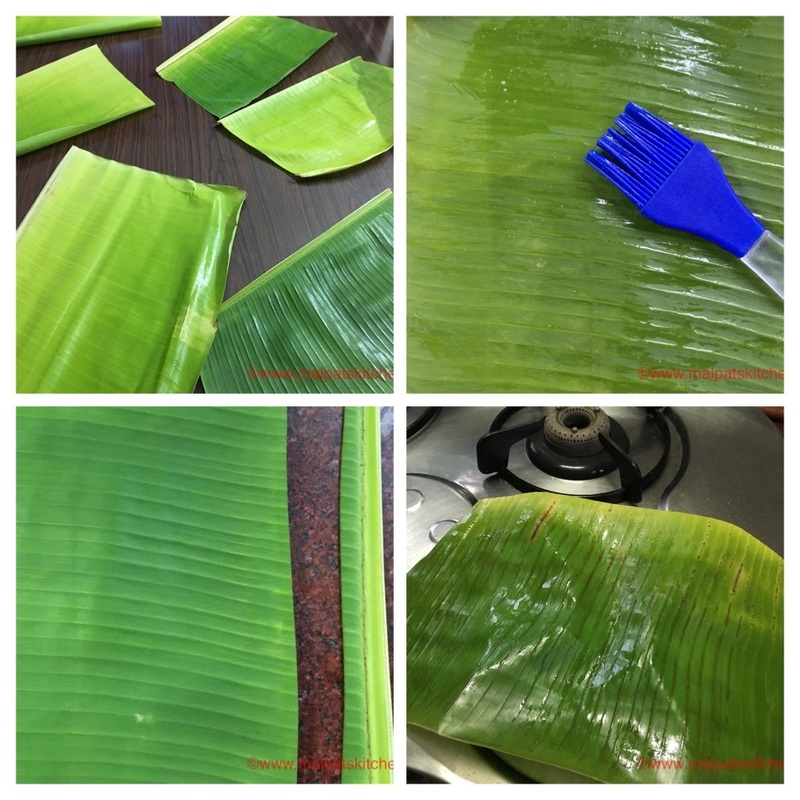 Banana leaves, not only add flavor to the dish, but also keep all the flavors intact, and protect food from burning. Banana leaves are widely used in South Indian, Indonesian, Malaysian and Sri Lankan cuisines. 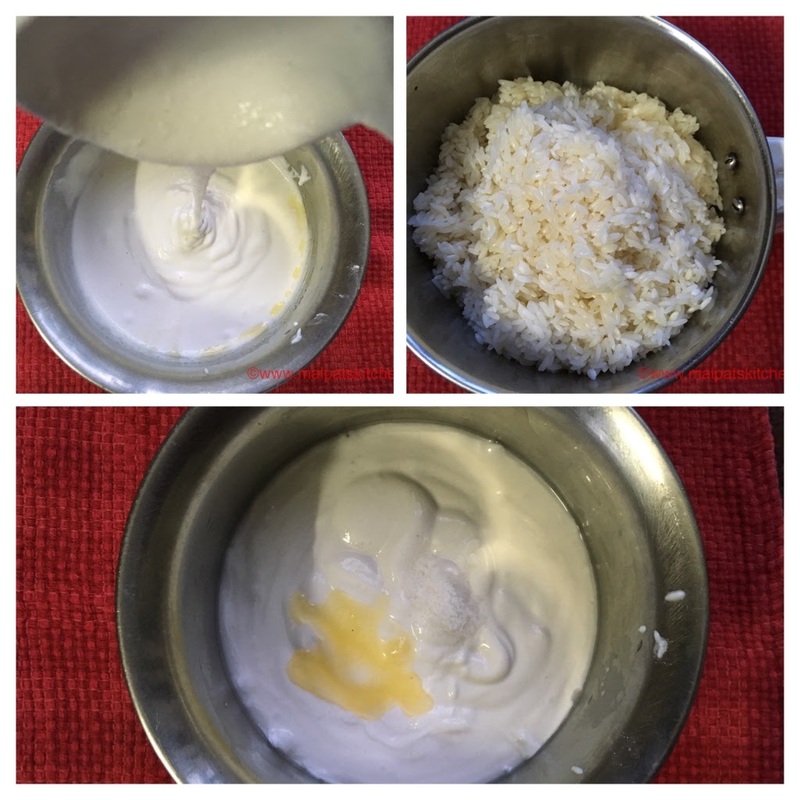 Though nowadays, many people use rice flour to make this, I have ground rice batter and made this recipe in the traditional manner. The poornam / stuffing can be made 2 days ahead and refrigerated. Jaggery measured, put in a pan and melted, then checked for impurities. 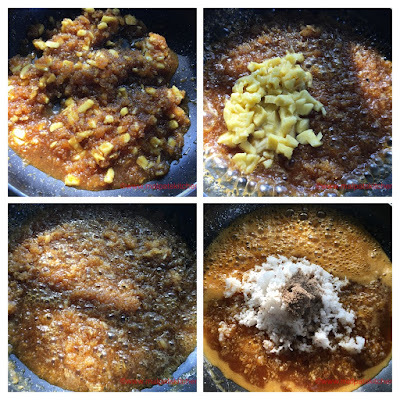 Keep it in a box, mix in 1 tso ghee, after it cools down, refrigerate. Overnight soaked raw rice and boiled rice, loaded into blender jar, ground into a smooth batter like butter, a pinch of salt and ghee added to the batter and mixed well. 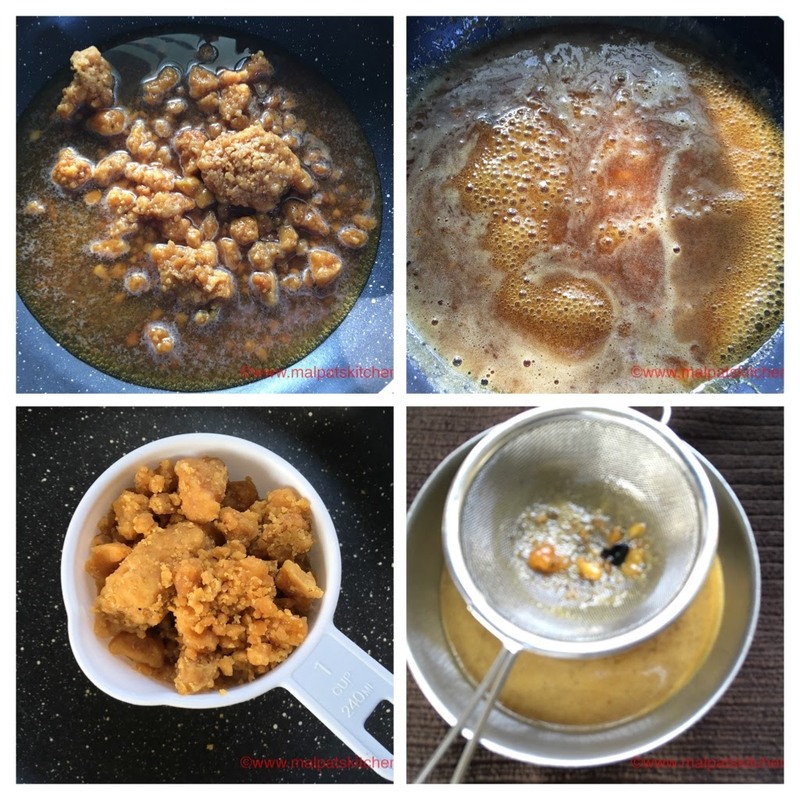 Consistency of the batter is also shown, it should be slightly thicker than dosa batter. Banana leaves have to be seasoned for this. First they have to be washed and wiped well, dried for some time, then the corner of the leaf removed, then toasted over flames till the leaf shrinks a bit, then slightly brushed with ghee and kept aside. For this purpose, tiffin leaves are ideal, so that the wastage will be less. 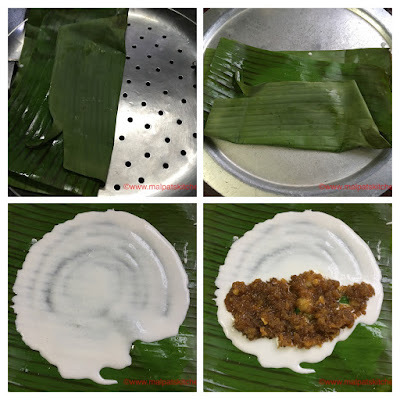 Take a ladle of batter, spread like dosa, spread generous portion of the filling to half portion, like how we do for masala dosa, bring the top portion of the leaf and close, so that it will be folded like a dosa, then make the leaf like a packet, and keep in the steamer, which already has been kept ready with boiling water. First, one packet kept, then 3 are lined, steamed for 20 minutes, then the picture where you see the discolored leaves are after steaming. Slowly open one packet and see. the adai will come out easily without sticking to the leaf. This shows, it is well cooked. *Some people make this delicacy with dried jack fruit also (called chakka varatti), but I think, using fresh jack fruit definitely gives more flavor. * You can make these adais, and just before eating, can warm them up slightly for 10 seconds in a microwave and serve them. They are really delicious!